Over the years I have had the opportunity to work with volunteers who do work in developing countries. 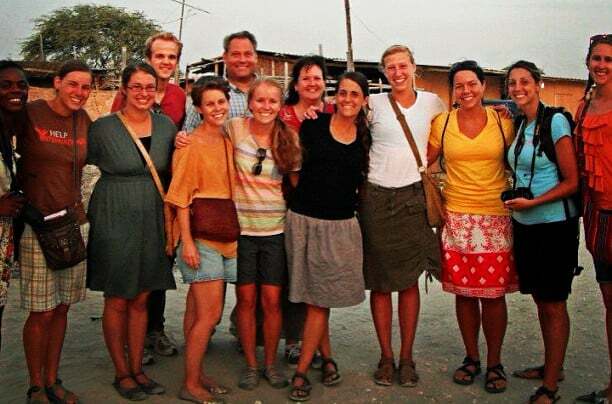 These volunteers—typically university students—dedicate up to three months each summer in leaving their comfortable, US-based surroundings to work in locations where poverty is the norm. Their work may include bringing water to a small mountain village, working to prevent river blindness, teaching single mothers about nutrition, building latrines, or any number of other welfare and educational projects. These volunteers often live in unfamiliar conditions where, while not typically dangerous, they experience many of the hardships found in some parts of the world. This may include limited access to clean water, less-than-ideal nutrition, dirty conditions, and crowded living spaces (during my last visit to Peru we had 19 young people squeezed into two small rooms on the upper floor of a small, concrete home). These conditions were also similar to what I experienced in previous stays in Guatemala and El Salvador, yet these young people choose to do what they did. Here we have 200+ students, all leaving the conveniences of life and family for a three-month period in order to work in conditions most of them have only seen on their 55-inch big-screen televisions or on their iPads. And what’s really amazing… they pay to do this! Each student is required to pay his/her own expenses, as well as part of the fees to support the projects in which they participate. Obviously, that ain’t gonna’ fly. Perhaps a bit of a stretch to emphasize a point, but let’s consider the intent. What makes 200 students willing to do what they do in this scenario? I make it a point to continually ask that question of each of the volunteers, who inevitably respond with variations on a central theme: they are willing to temporarily overlook the “satisfaction elements” because they have chosen to be engaged in what they do. They find meaning, autonomy, growth, impact, and connection (M-A-G-I-C) in what they do. Let’s take a look at why this is the case, by examining how employee engagement differs from satisfaction. Certain elements must be present in order for me to be satisfied in my work. These elements may include safety, basic levels of respect, tools to do the work, training, and even appropriate compensation. However, these volunteers are willing to overlook these basic satisfaction elements for a temporary period (in this case, three months of the year) because the elements of engagement (ENGAGEMENT MAGIC) play a greater role for them than does the need for those things we generally consider factors that satisfy us in our work. Are they satisfied? Yes. But not because what we consider “the basics” are in place. They’re satisfied because they are engaged. each of these elements is in place. Further, the more I, as an employer, provide these for you (“let’s bring in a foosball table and hot chocolate machine for every floor!”), the more you’ll be satisfied. Right? Not quite. Engagement differs from satisfaction in that engagement involves the heart, hands, and mind of the employee (or volunteer), rather than the transactional relationship brought about by satisfaction factors. 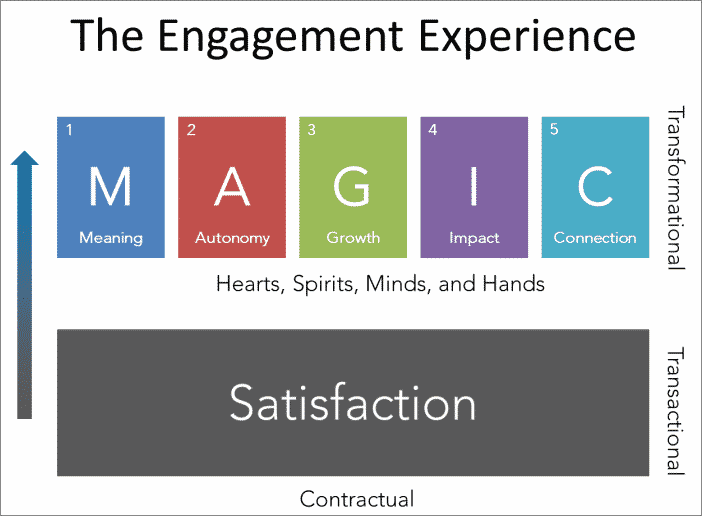 Engagement occurs when the ENGAGEMENT MAGIC elements of engagement—meaning, autonomy, growth, impact, and connection—are in place. The volunteers found ENGAGEMENT MAGIC® in what they did. In thecase of these students, each continually cited meaning (when the work has greater purpose beyond the task itself) and impact (when I can see the positive outcomes of my efforts) as primary reasons why they were involved in this work. Not a single volunteer mentioned, “It pays well,” or “I like the foosball break room.” Obviously, not many of these satisfaction factors were present in their day-to-day working conditions. Yet, many businesses today ignore engagement factors, and focus solely on satisfaction. However, satisfaction factors do not bring hearts, hands, and minds into the game. While satisfaction is important, it’s transactional, and reaches a point of diminishing returns. Foosball tables and free drinks only go so far—and we must continue to outdo what we’ve already done. Yet, as these volunteers can attest, MAGIC happens when we include hearts, hands, and minds. These young volunteers were able to accomplish some pretty amazing things—and it was because they chose to do so. What are your employees choosing?